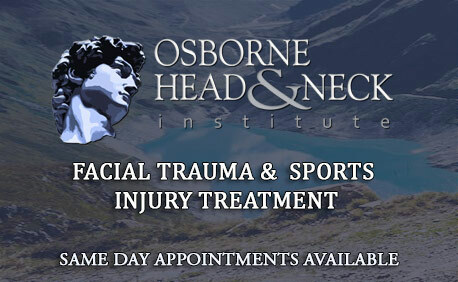 Welcome to the Division Facial Plastic and Reconstructive Surgery, at the Osborne Head and Neck Institute, world-renowned experts in the diagnosis and treatment of cranio-nasal-facial trauma and sports injury. We are experts in the management of facial trauma including nasal fractures (the broken nose), orbital blowout fractures, mandible fractures (jaw fractures), zygoma fractures (cheek fractures), sinus fractures, lacerations and scar revisions. Nasal fractures are the most common facial trauma or sports related injury. Immediate evaluation is required to prevent late complications. Zygoma or cheek fractures occur most commonly from falls on unpadded surfaces. The zygoma is an important support for the eyes and teeth. Mandible or maxillary fractures involve the bones that support and protect the teeth. Good alignment is paramount for normal function. Orbital blowout fractures involve the “eye socket” and are common after a errant blow to the eye. Early treatment prevents impaired vision. Neck injuries are commonly associated with facial trauma. Proper diagnosis and management helps avoid long-term problems. Untreated ear injuries can cause severe deformity. Prompt therapy can prevent cauliflower or wrestler’s ear commonly seen in MMA. Sports related concussions have gained a lot of attention lately in the press. The potential for long-term cognitive and motor impairment have turned the spotlight on how sports teams and organizations are treating and managing their athletes with concussive brain injury. The public and athletes alike are sounding the drum, demanding better protection for themselves, children, and family who participate contact sports. Our knowledge of concussions is improving and we are developing better methods to manage this serious but silent sports related injury. The Osborne Head and Neck Institute has heard the call and has incorporated services for the evaluation of athletes who have suffered a concussion. To learn more about concussions, click here. Before (left) and after (right) repair of nasal fracture via a minimally invasive procedure called closed nasal reduction. Patient was able to have his fracture repaired one week after trauma.